I feel honoured to write a foreword to this authentic and excellent book by Geeta Radhakrishna. Geeta's approach to Mohiniattam is spiritual. For her, Mohiniattam is the vehicle of expressing her love for the Lord - a means of connecting with the supreme - a meditation! I have had the good fortune of witnessing her performance and have experienced, to what aesthetic and spiritual heights she rises herself and lifts the audience also alongwith! She is dedicated and totally committed to Mohiniattam. Mohiniattam was a dying art, when the late Malayalam poet laureate, Mahakavi Vallathol Narayana Menon attempted reviving it in his renowned Kerala Kalamandalam, way back in 1950s. I had visited Kalamandalam at the instance of Mahakavi Vallathol and had gone to see the Mohiniattam classes. Guru Chinnammu Amma, with three or four students, was conducting the class in a homely atmosphere. After witnessing the Mohiniattam class, the first thought that occurred to me was that Mohiniattam is a mild offshoot of Bharata Natyam and Kathakali. It had only a very small repertoire with five to six items. Later, a few artistes tried to revive this art form with new innovations worthy of a full- scale performance. Geeta Radhakrishna is one of the foremost pioneers who achieved this noble end. There was a time (1953) when Shanta Rao, the well known dancer, threw a challenge for anyone to come on stage and give a Mohiniattam performance, which of course, none could meet then! There were pretenders too, who claimed to be authorities, interested not in the revival of Mohiniattam, but in self-promotion. Geeta Radhakrishna is most eminently suited to be recognised and lauded for her painstakingly intense and extensive research into the dance art of Mohiniattam as she has the right attitude (spiritual) and the right approach. When she takes her stance on stage, she merges herself with the dance, totally losing her identity and becoming one with dance itself. Whether she performs Nritta or Abhinaya, it is with amazing grace and fluidity, as an offering for her beloved Lord. This is what makes her "special". The fact that she hails from Kerala and understands all nuances of Malayalam, makes her even more unique. To say that her dance choreography of Narayaneeyam has enhanced the original classic is no exaggeration. Geeta has breathed new life and strength into Mohiniattam is the truth. Geeta has reason to have a sense of fulfillment as Radhika Radhakrishna, her daughter, is a highly gifted and natural dancer. She, I am sure will be preserving, what Geeta has achieved with her dedication and devotion to Mohiniattam and further enhance this art form to its zenith. I congratulate Geeta heartily for systematising, codifying and drawing the fundamental Adavus and postures, so vividly, so that this book will serve the students, teachers and art lovers as a guide, now and in the future. In the early 1970s, Mohiniattam was a rare performing art form, that's when I began my innings in Mohiniattam. When I said that I was a Mohiniattam danseuse, people looked at me blankly. Many had not heard the word Mohiniattam. From 1975 onwards, I began performing Mohiniattam at various venues in Bombay. In 1976, I made my first trip to England and Switzerland to perform Mohiniattam and give lecture demonstrations as well. This helped a lot in the propagation of Mohiniattam. There is nothing better than an actual performance with a live orchestra to support you. No amount of talking can convince a person of the beauty or aesthetics of an art. A dance has to be visualised, to be appreciated. The flavour, mood or sentiment of dance has to be enjoyed and experienced. By the 1980s, Mohiniattam became well known in the performing art circles. Still the general public was quite unaware of Mohiniattam. 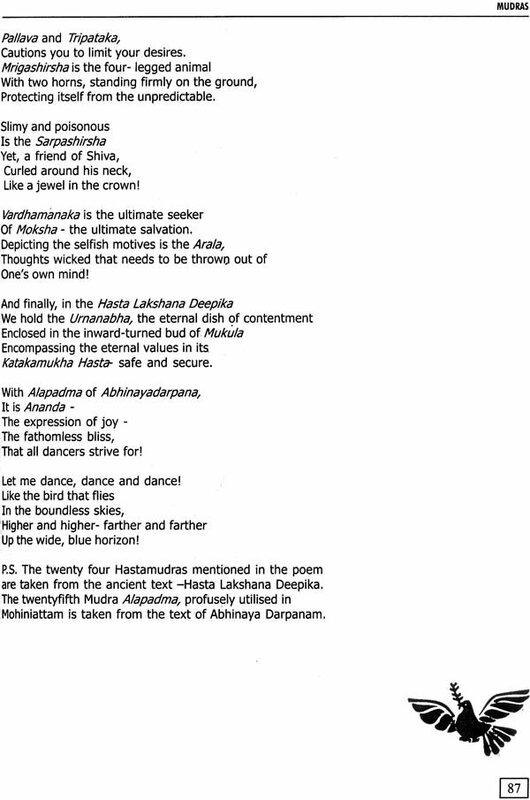 Bharata Natyam and Kathak were well known but not Mohiniattam. In 1985, when I began teaching Mohiniattam in Bombay, I had just five students. Many who came to learn dance, had heard the name Mohiniattam for the first time. I had to do a lot of explanations and convince the dance aspirants that Mohiniattam was a full-fledged dance form and a very graceful dance style at that. In 1990, many students joined to learn Mohiniattam. Meanwhile, I continued giving a number of Mohiniattam performances, especially in Bombay which created a wider public awareness of this beautiful dance style. By 2000, Mohiniattam fully established itself as a classical dance style of India. During the first half of 20th century, only four classical dance styles were known. They were Bharata Natyam, Kathakali, Kathak and Manipuri. It is only during the latter half of the 20th century that styles like Odissi, Kuchipudi and Mohiniattam made their presence felt. With the advent of television and other mass media, the accent on classical dance is much less when compared to other forms of general entertainment. It is promoted and appreciated by only a small circle of art lovers. Of the seven classical dance styles mentined above, Mohiniattam could be categorised as the rarest, performed and learnt by a handful only. Kerala State has plenty of Mohiniattam dancers but the same cannot be said of other states in India. One reason that I would attribute to Mohiniattam having few takers in metropolitan cities is that learning a style like Mohiniattam involves a lot of effort. The whole body needs to be activated. It is not the limbs alone but the movement of the torso as well. It cannot be learnt quickly or in a short period of time. It takes time to move the body in an effortless grace. One has to make persistent and continuous effort to get the movements right and dance with ease. It also takes a lot of patience and perseverance to become a good Mohiniattam danseuse. Over the years from 1985 to 2007 - last 22years, I must have taught Mohiniattam to atleast a hundred students. Of these, more than 25 students have completed the Mohiniattam Adavus Series, as systematised and codified by me in this book. This book has helped my students tremendously. It has also helped dancers from different parts of Europe, who have bought my book and attended my Mohiniattam workshops in France, Belgium and U.K. 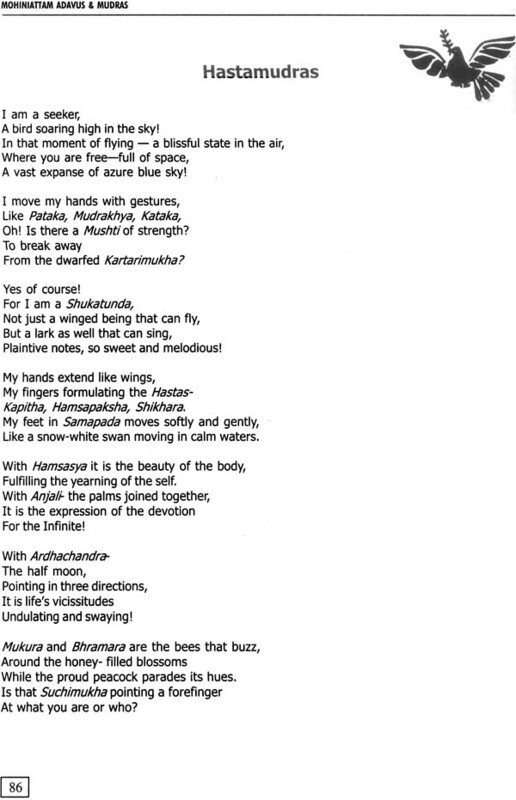 I have a Russian student too, named Ala Govarova, who has learnt the entire 15 Series of the Mohiniattam Adavus book. There are several dancers and teachers, who are not my students, yet they are learning the Adavus from this book. The drawing helps them to learn and imbibe the technique well. I am happy for all those who have learnt from this book. This book is meant for all those who have a desire to learn, to choreograph, to create with an open mind. Whatever the technique or style, the ultimate aim of a dancer is to become one with the dance and enjoy the aesthetic bliss. Mohiniattam dancers have had no written records of its Nritta. Nritta is pure dance. It forms the base of a dance style. 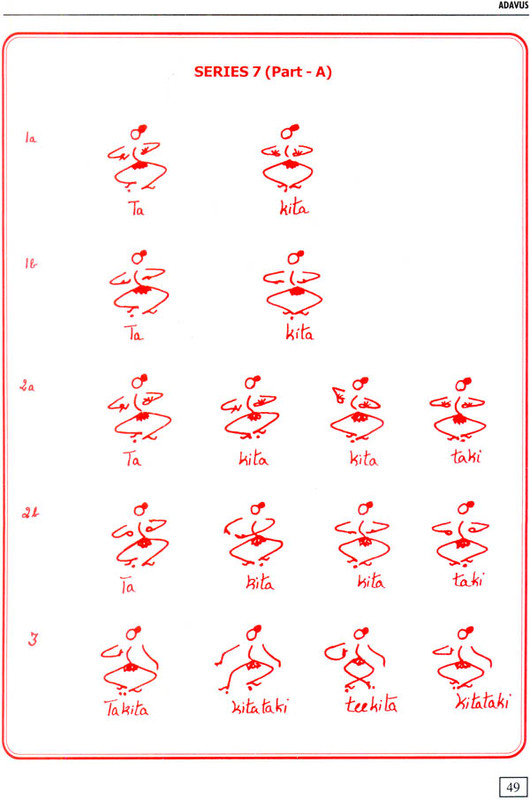 The characteristic features of the Nritta or pure dance, is the essential aspect that gives the individual stamp to the dance style. In the case of Mohiniattam, unfortunately, there has been no books or any kind of records. Both Kuchipudi and Odissi were rediscovered just like Mohiniattam after long years of neglect. But their case was different because Kuchipudi had a definite continuing tradition to follow while Odissi had palm-leaf manuscripts and sculptures to base upon. Mohiniattam had suffered a break but luckily, there remained an item called "Cholkettu", which was handed down by the Mohiniattam dancers and teachers themselves. Cholkettu has been the saving grace of the technique and style of Mohiniattam.Though, Cholkettu is the only item handed to us from the past, yet unlike the invocatory item Alarippu in Bharata Natyam or Todayam in Kathakali, it is a store-house of Adavus. I learnt a Cholkettu from my teacher Kalamandalam Kalyanikutty Amma.It is a beautiful item full of exquisite Adavus with an intricate pattern of rhythmic movements set to vibrant chollus. The chollus are sung in ragam Chakravakam set to Adhi Taalam. It begins with a song in praise of Bhagavati (Goddess) and concludes with a song in praise of Lord Shiva. 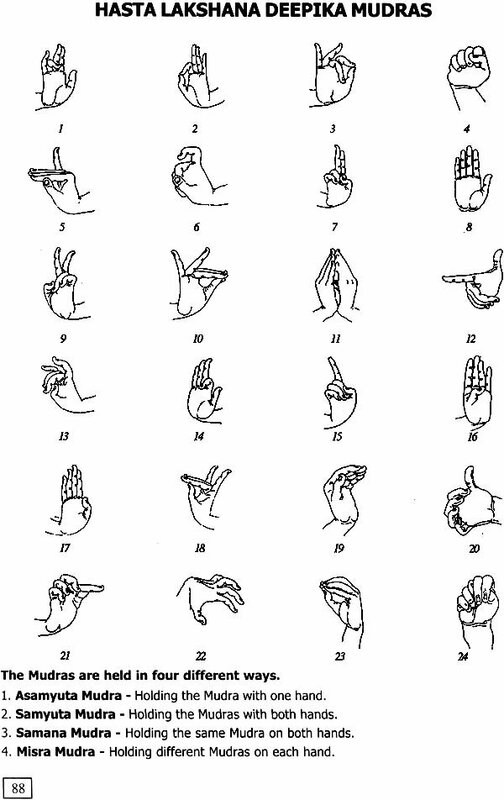 Later, when my research work in Mohiniattam started, I had the opportunity of learning another Cholkettu fom Kalamandalam Sathyabhama, as taught to her by Chinnammu Amma. So, I had a repertoire of two Cholkettus, which had their similarities but had variations too. I felt happy about the variations because it added to my Adavu repertoire. I had more movements to work upon. That's when I began the work of systematising and codifying the Adavus. There needed to be a strong and accurate system for teaching. So while teaching, I evolved a style and in the process, learnt a lot myself. I analysed each movement, retained the original movement as an Adavu in the Series plus I combined different original movements to arrive at a new movement. I then channelised the Adavus in order of their characteristic features. Putting them in order took a long time. Meanwhile, in 1989, I was given a Fellowship by the Government of India, Department of Culture, which initiated me into drawing the figures of the 150 Adavus that I had systematised into 15 Series. Drawing the Adavus took me two years and was quite strenuous particularly for the eyes. To get the perfect shape of the line drawng, it had to be drawn again and again in right angle. But the attempt was worthwhile. Finally in 1991, I was able to publish the "Mohiniattam Adavus " book. Today, I am even happier to bring out the second edition of the book. This book is not just Adavus alone but also gives a detailed section on Mudras as delineated in the ancient text of Hasta Lakshana Deepika with the original Sanskrit Shlokas. Mohiniattam dancers utilise the Mudras of Hasta Lakshana Deepika. The last section gives the essential theoretical study as given in texts of Natya Shastra, Abhinaya Darpana, Bharatarnava and Sangitaratnakara. I truly hope that all artistes who have an innate sense of rhythm and dance in them, with a creative urge to innovate, will make use of this book. Needless to emphasise, Mohiniattam is an extra-ordinarily graceful style. The beautiful languorous movements with its fluidity and silky texture, should attract the dancers to learn this dance of the enchantress.